Judge smacks the gavel on the desk to get order in the courtroom. On one side of the courtroom Author Tonya Kappes is preparing to defend the lawsuit Maggie Parks has filed against her. While Maggie Parks is on the other side of the courtroom. Judge: Ms. Parks, please state your claim. Maggie Parks: I’m here today for you to order Tonya Kappes to make my familiar an animal like every other witch out there. Judge: What exactly did she make your familiar? Maggie Parks: A 1965 red AC Cobra. Judge: A car? A muscle car? Tonya Kappes: Funny (she snickers under her breath). Maggie Parks: See! She thinks it’s funny! It’s not funny. Everyone else in my FAMILY has an animal. My sister Lilith has a bird, Aunt Meme has an owl, and mama has a cat! I get a car? Judge: Ms. Kappes, what do you have to say for yourself? Tonya Kappes: It’s funny. Vinnie is a 1965 muscle car that is so jealous of Maggie’s suitors, including Mick Jasper the undercover agent for SKUL, the Secret Keepers of the Universal Law. He has to get in Maggie’s car sometimes during the investigation and Vinnie is so jealous of him. Mick is very cute and hot, if you know what I mean. Judge smacks the gavel: I rule in favor of Author Tonya Kappes. She knows how to use her imagination to bring smiles to even the maddest of faces. Maggie Parks darts out of the courtroom and all we hear is Vinnie squeal his tires. While Maggie waits for her Witchy Hour, she works at the family diner with her mom, aunt Meme and Lilith, her sister – all witches. Soon Maggie gets entangled with a mysterious handsome stranger, Mick Jasper, and his secret U.S. organization, SKUL. Has she found her calling? Be sure to visit each blog on the Spies and Spells blog tour. At each stop you will notice a bold and italicized word. These words make up one sentence. On April 9th, the last blog stop, you will have to opportunity to answer the sentence question and be entered to win a Tonya Kappes Loves Her Readers Mystery Box! 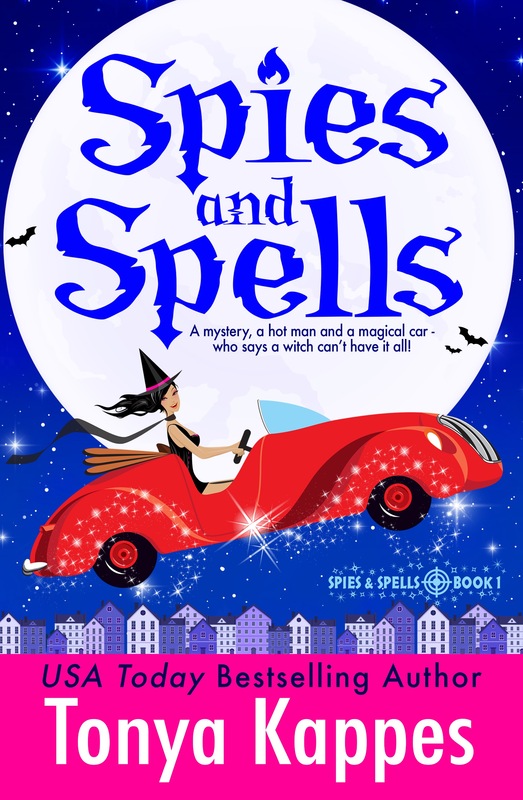 On each blog stop, you will be able to enter a Rafflecopter giveway for a $50 Amazon Gift Card and signed print copy of Spies and Spells from Tonya Kappes. 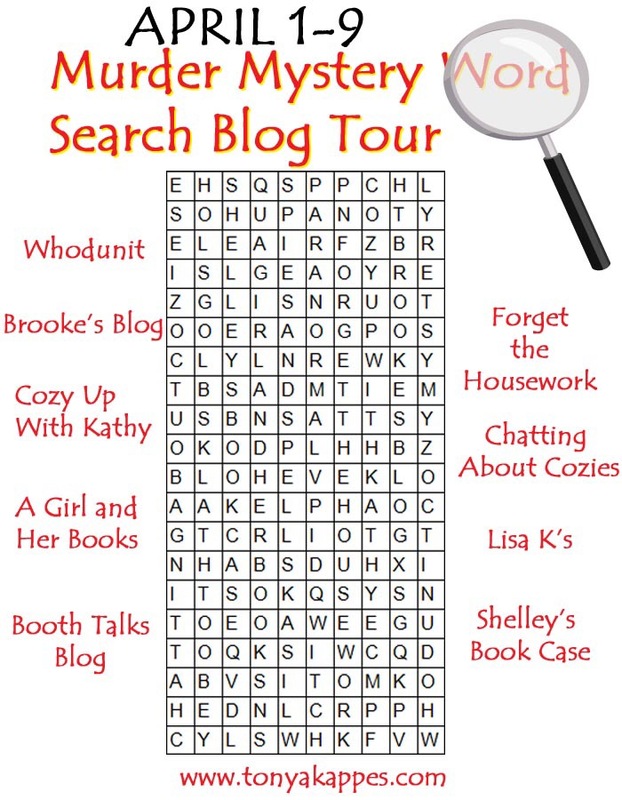 An added bonus~ All the blog titles are in the word search puzzle above. There are four extra mystery words in the word search. Find them and be entered to win a Starbucks Gift Card, Kappes mini Tote, Kappes flashlight pen, and Kappes sticky notes! You will be able to tell them to Tonya on April 9th! Good luck!